Why Do Some Dogs Sleep on Their Backs? Why Does My Dog... Sleep Belly Up? 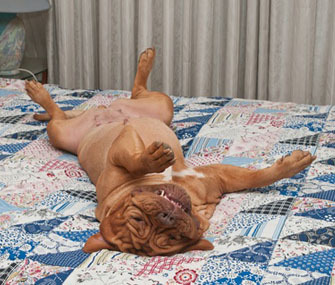 There are no solid stats to reflect the incidence of dogs willing to sleep belly up, but an informal survey of the dog owners you know will probably reveal something like this: 5 to 10 percent of pet dogs sleep with their bellies bared on a fairly regular basis. But these squishy stats are for pets only. Perhaps not surprisingly, sleeping belly up is not a common behavior among wild canids. Their greater security concerns are likely responsible for an unwillingness to bare all. After all, to offer up one’s soft underbelly when you’re already at your most defenseless is not exactly in a predator’s best interest –– much less in his nature. And this may help explain why some pet dogs are more willing to sleep with their bellies exposed than others. It seems that more relaxed, easy-going dogs are over-represented among those who regularly assume a belly-up position –– the dogs most temperamentally distanced from their wild cousins. Of course, there’s a lot to be said for the role of socialization as well. Dogs who engage in this behavior tend to be secure, well-socialized individuals who enjoy safe, stable, comfortable surroundings. So what does that say about dogs who aren’t into baring their bellies? Probably not much. It seems this favorite posture is a preference above all else.